This post guest-editor is Herman Maes and uploaded to speedsurfingblog by Erik. As a first post on speedsurfingblog.com I want to give some credits on one of the persons who are making the whole gps speed revolution so much easier, by providing gps-results (gps-speed.com). 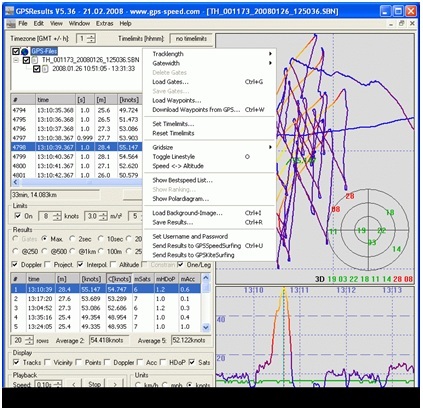 Manfred Fuchs is the German developer of this gps analyzing software and the PRO version is used to organizing almost all gps speed competitions in Europe. Manfred, can you give the readers a small introduction? I started windsurfing on some small lakes and later on the island of Fehmarn in the early ‘80th when I studied Physics in Göttingen. In 1986 I moved to Hamburg to work for Philips Research with the advantage of being much closer to both North and Baltic Sea. Later I competed in speedsurfing events in northern Germany, Denmark, and Fuerteventura. There I first met Martin van Meurs and some other Dutch speedies that came to the german speedweeks. Within the german speedsurfing association I became responsible for the video timing, first cable based, later with wireless transmission and developed evaluation software for it. My programming skills started with Fortran, Basic, and Assembler, nowadays I’m working mainly on Windows PCs with Microsoft Visual Studio in C and less frequently on Macs with XCode. At the start of the gps-revolution we had to work with gartrip and later the French software gpsar was released (using the java-framework). GPS-results was released in 2008, is this correct? 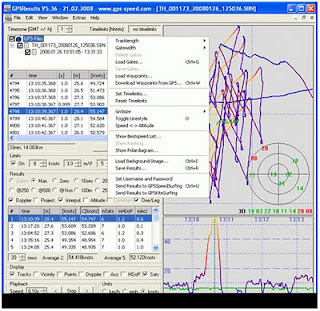 What did you decide to make your own gps analysis software? We used GPS units first for measuring the length of the 500m courses. I brought some Garmin units from the US where they were much cheaper as compared to Germany and started to write a program to read the saved trackpoints via their serial interface. This ended in the early version of GPSResults in 2005, when Markus Schwendtner asked for a faster and easier to use GPS-evaluation software as compared to was available at that time. Knowing Martin van Meurs and finding out more about his project GPSSpeedSurfing further pushed the development. When I realized the reason for the grid effect of the early Garmin units (truncated precision) I looked for units that are better suited for our purposes. When the Aussies came up with the idea of using Dopplerspeed measurements for better accuracy I supported this develpoment in the techgroup of GP3S. Being myself an IT programmer I know how many hours you can work on a new software release. Could you for how long you worked on the first real version of gps-results? It's remarkable on the website gps-speedsurfing.com that the online gps speedsurfing world is dominated by the northern European countries (The Netherlands, UK, Germany, Sweden,...). Do you have also that impression seeing the use of your software? Last september you broke your personal gps-records. Do you have specific goals in your head or is the big 50 also for you the Holy Grail? 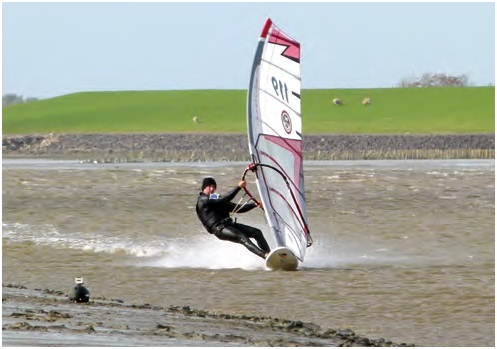 With Vollerwiek and Buesum you've also some very fast speedspots in germany which are already 50 knots approved. What would be your perfect day to break the 50 knots on those spots? See above, the problem with the tidal spots is that so many parameters have to match, most important besides wind speed are water level and wind angle. When it blows for several days the tideways do not show up anymore since the whole area is flooded, so it has to be a fast low-pressure system coming to the right (day) time. The directions are very limited and if the wind is too square the water is mirror flat but good speeds are not possible. Same is true if it is too broad, because then the rolling chop prevents super fast runs. It must be a good feeling to see, that most of the European speed contests this year where using your gps-results pro software especially created for running gps speed competitions. Compared with some years ago, a big investment into the video timing equipment isn't needed anymore. How is your view on this (r)evolution for organizing speed contests? In the last years all speedsurfing competitions I’m aware of in Germany, Holland, Sweden, Belgium, and England were done with GPS technology and GPSResults Pro. It is so much more flexible and easier to evaluate that in my opinion the video-timing age is over. Only official 500m record attempts are still performed with video-timing as GPS would require a higher sampling rate (10Hz instead of 1Hz) for that purpose. GPS-results is the leading gps analysing software which is available for PC and mac-users and can be tested with the 30 days evaluation version. More information can be found on gps-speed.com. An Adnroid app would really be welcome!